Research!America's 2010 National Forum was a discussion among nationally recognized leaders in health research--a "who's who" of government, academia, industry, media and patient advocacy. Two discussions were followed by question-and-answer sessions. Conversation focused on the fundamental role of research in the U.S. economy and the American way of life. As the country continues to emerge from the economic recession and our leaders prioritize limited resources, participants examined topics important to the future of research in our country. More than 200 stakeholders filled the room to be part of a high-level policy discussion featuring many of our nation's most influential thought-leaders in medical research, public health and advocacy. 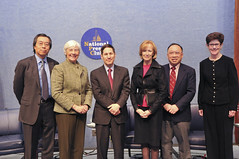 Judy Woodruff, of "PBS Newshour," moderated the panel "Working Toward Better Health for All," featuring Paul Chew, MD, chief science & medical officer, sanofi-aventis U.S.; Carolyn M. Clancy, MD, director, Agency for Healthcare Research and Quality; Thomas R. Frieden, MD, MPH, director, Centers for Disease Control and Prevention; Jennifer Howse, PhD, president, March of Dimes Foundation; and Robert Tjian, PhD, president, Howard Hughes Medical Institute. 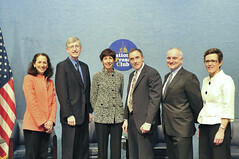 Michael Kinsley of The Atlantic moderated the panel "Translating Discoveries into Better Health," featuring Margaret Anderson, executive director, FasterCures; Francis S. Collins, MD, PhD, director, National Institutes of Health; Margaret Hamburg, MD, commissioner, Food and Drug Administration; Barbara Kunz, president, Health and Life Sciences Global Business, Battelle Memorial Institute; and Jack T. Watters, MD, vice president of external medical affairs, Pfizer Inc.